geniaBeana Scraps: Follow me to the Girls Gone Scrappy Blog for More Freebies! Follow me to the Girls Gone Scrappy Blog for More Freebies! We're all set to launch our new blog and the website is coming along nicely. We've been hard at work collaborating on a free kit to share with everyone. 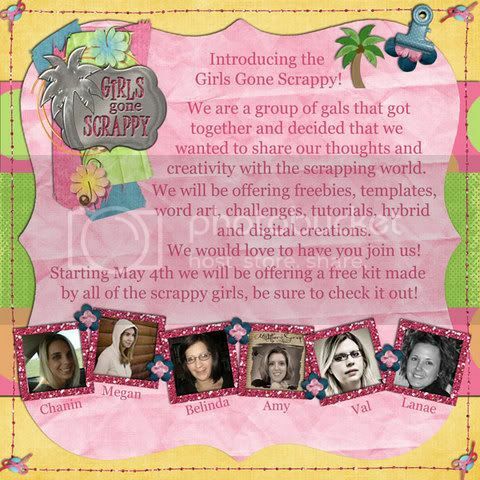 You have to go to our new blog to get to the Girls Gone Scrappy Blog rest of the kit. Be sure to leave us all some love as we've worked really hard to get this together and we appreciate your feedback. So now head on over to the GGS Blog and find the rest of our collab. Soo Cute!!! Love the kit! Yay! I can't wait to use it. Thank you so much for this Freebie. I want to let you know that I posted a link to your blog in Creative Busy Hands Scrapbook Freebies Search List, under the Kit(s) post on May. 04, 2009. Thanks again. Thank you! Your blog post will be advertised on the DigiFree Digital Scrapbooking Freebie search engine today (look for timestamp: 04 May [LA 07:00pm, NY 09:00pm] - 05 May [UK 02:00am, OZ 12:00pm] ). This is great, you did a wonderful job! Thanks! Thank you so very much for sharing your portion of this darling kit! This generous gift is sincerely appreciated. Wow, I have died and gone to digi scrapping heaven!!!! Thank you and the GGS's for such wonderful work. I couldn't work out how to leave some love over at GGS, so hope you can pass some on ... you are AMAZING ... thank you, thank you, thank you! MWAH!! Thanks so much! What a nice kit! GGS Collab and BIG BIG NEWS! News and a New Kit from Snowflake Beach Designs!